Time for another glimpse behind the scenes in the Cycle Map development! Now for all the OSM types there’s a few caveats. The last time I posted a teaser (for contours) it took me six months to get things working properly. And there’s plenty of things need fixing before the hillshading will go live, like some resolution issues, tiling issues, a minor problem involving the ocean shapefiles and so on – never mind choosing some colours that are a bit more subtle. So be patient! This entry was posted in Uncategorized and tagged OpenStreetMap on May 21, 2008 by Andy. And that’s a _lovely_ stretch of NCN 8 to choose – some good footpath mapping in the area, too. Though I might ask for one of your popup warning triangles saying “if you’re cycling this bit at night, watch out for the handlebar-height barrier across the path right at the bottom of the hill”. This looks lovely. I’m a little scared it’ll make the map harder to parse though. A very subtle greyscale might be better: cyclists only really care about local gradient, not absolute heights, so a full-on rainbow height map might be overkill. Will cycleway=* be rendered as routes (/hazards) in urban areas? Whoops, I fail at reading. Sorry. nice! I’m a bit new to OSM where is altitude data recorded? or is this something you are adding to the data from another source? Altitude data comes from the NASA SRTM project – have a look through the mailing lists or this weblog for more details. Is there any way to correct SRTM data on the Cycle Map? The following link, http://www.openstreetmap.org/?lat=38.47166&lon=-109.73651&zoom=15 shows the road going to Dead Horse Point State Park, in southern Utah, near where the shot the movie “Thelma and Louise”. 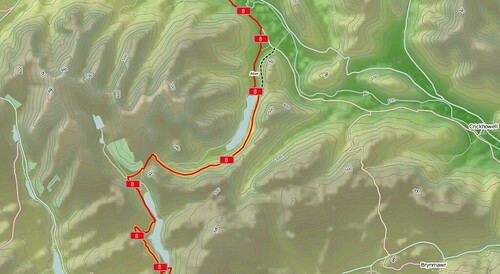 Unlike what the contours indicate, the road does not go down a 1000 foot cliff, then run level. Actually it runs along the top of the cliff over a 40′ wide “hogback” which drops 1000 feet on either side. It then ends on top of a small 1000′ mesa. The cyclist hoping for a wild vertical ride would be disappointed, but the view from the top is superb.